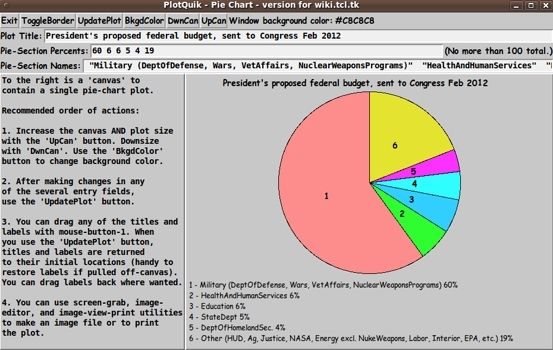 The FE 'PlotQuik' PieChart GUI interface. --- and the scripts here may be revised occasionally. Just below is a list of links to pages that present the source code of a collection of the 'PLOTtools' in the FE 'tkGooies' system. Some of these plot utilities, labelled 'PlotQuik', will be written completely in Tcl-Tk. As alternatives, some of these plot utilities will be Tk GUI 'Front-Ends' for the popular, widely-available 'gnuplot' program. for making pie charts QUICKLY --- from a set of numbers entered in an 'entry' field on the GUI. for making point (and line) plots QUICKLY --- from x,y data entered in 'entry' fields on the GUI. for making line plots QUICKLY, --- from a MATH EXPRESSION of the form f(x) entered on the GUI. for making bar-charts QUICKLY --- from x,y data entered in 'entry' fields on the GUI. (for making x-y OR x-y1-y2 plots QUICKLY --- from 2 or 3 columns of data selected from any columns of data in a user-selected file, which may contain MANY data columns). The FE 'PlotQuik' utilities above may serve most of my plotting needs, but there is always a possibility of creating another type of plot. For example, the 'PlotQuik Points (and Lines) from x,y data entered in entry fields' script could be used as a basis to make a plot utility that does a 'ribbon' plot instead of a line plot. And the 'Plot Quik Bar Chart' script could be used as a basis to make a plot utility to make '3D-looking' bars. And the 'Plot Quik Pie Chart' script could be used as a basis to make a plot utility to make a '3D-looking' pie. A Front-End for generating a PIE chart --- from data in a small (one or two lines) data file --- or from values put in an 'entry' widget of the GUI. And maybe two or three more Front Ends to 'gnuplot'. End of List of Code-Links. Use the list-of-links (above) to go directly to web pages that contain source code along with code-descriptions and screenshots. The Tk script files (and other auxiliary files, if any) are in text files that can be down-loaded to your computer and implemented. To download, simply 'right-click' on a text link and, in a popup window of your web browser, choose an option such as 'Save Link Target As ...'. Links to FE 'tkGooies' CODE - 'PLOTtools' group page. Page was created 2014 May 11. Page was changed 2016 Feb 02. Page was changed 2017 Sep 21. Page was changed 2017 Sep 28. Page was changed 2017 Oct 05. Page was changed 2017 Oct 08. Page was changed 2018 Aug 19.